India will look to try out a few new combinations. With one win each, the ODI series between Australia and India is evened out at 1-1. The two teams will compete yet again, for one last time on this tour, to determine who will lift the trophy. After the victory in the second ODI, India will go in with a very much positive mindset. They have got most of the boxes ticked off. Yet, there are a few areas to be addressed. As Virat Kohli and Ravi Shastri mentioned, they are not playing with a win-it-at-all-costs attitude. There are only eleven more games left before the World Cup and trying out all the combinations seems to be the priority. Hence, team India could surely make some changes to see how different players react to the circumstances. These modifications to the eleven, though, will not impact the performances a great deal as there are like-for-like replacements available. The duo of Shikhar Dhawan and Rohit Sharma will only get better with time. These two didn’t have as much as match time as they’d have liked before the ODI series. But, now that they have played two games and looked good, they should be great to go in this decider. Dhawan looked class-apart with those flowing drives and chips over the infield in the second ODI. He was unfortunate to have not capitalised on the start. Same goes with Rohit who got out in his 40s. Both these players perform well in big games and will wish to put up an eye feast for the fans in the upcoming match. Virat Kohli, just like on any other day, registered yet another century in the second ODI. ‘Cheeteh Ki chaal, Baaz ki nazar aur Kohli ki form par sandeh nahi karte. Kabhi Bhi maat de sakti hain’ – These (modified) lines from the movie Bajirao Mastani just describe his innings perfectly. He will have a huge role to fulfil with the bat and will hope to boss around once again. Ambati Rayudu‘s place in the side is a debatable topic after the last two outings. There have been demands about bringing Kedar Jadhav into the XI. But, the management has got enough trust in Rayudu and he will surely get an extended run at number four. MS Dhoni’s form was the biggest positive from the last two games. With two back-to-back fifties, he is just about getting in line and fitting into his role. There will be high expectations from him in the third ODI too. The newly assigned finisher, Dinesh Karthik will continue in the same role and will be critical down the order. 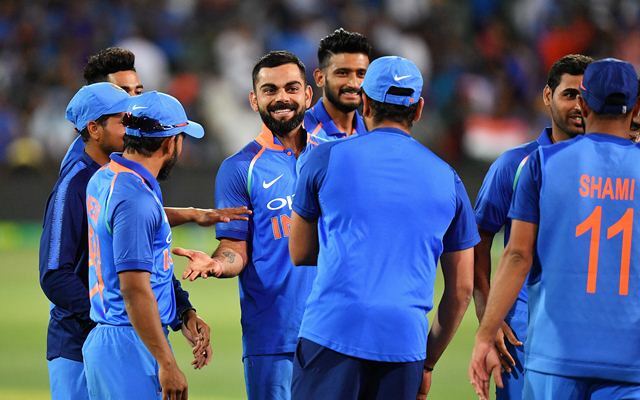 There was a mention of Vijay Shankar at the post-match presentation by Virat Kohli after the second ODI. This could possibly be a hint that they are looking at him as a possible option. The management will be eager to test him out as it will also give them the freedom to make some other changes in the bowling department. Shankar has been in good form of late and could be making his ODI debut. Jadeja hasn’t contributed hugely to his cause in the last two games even though he was brilliant on the field. Bhuvneshwar Kumar rediscovered himself in the second game of the series. He picked up four wickets in the game, put breaks on scoring towards the end of the innings and was just as critical as Kohli and Dhoni were. The pacer will gain a lot of confidence from this performance and will look to carry the momentum forward. He will share pace duties with Mohammed Shami who has done well in both the games of the series so far making a strong contention for the World Cup 2019. Kuldeep Yadav, despite a dismal outing in the last game, is most likely to get another go. His spin-twin Yuzvendra Chahal is expected to be back in the side. Chahal has got great adaptability and is more than capable of doing well on the Australian pitches. But, the absence of Hardik Pandya forced the management to go with an additional seamer which didn’t help his cause. Now, if Vijay Shankar can take the all-rounder spot, Chahal will get in without a second thought. He should enjoy bowling with the long boundaries at the MCG. Also, with Siraj and Khaleel not doing so well, he should surely be in the reckoning.